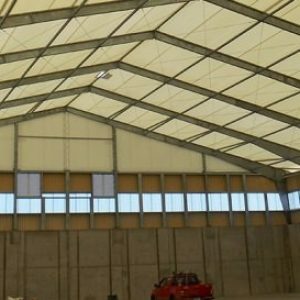 The most obvious advantage of fabric structures is their translucency, with an appropriate coating over the woven base cloth allowing a light transmission value of approximately 10%. Compared with the full glare of outside, this provides a very comfortable level of brightness. Another benefit of fabric above other material is its clear span capabilities. Fabric can reach from one point to another in an unbroken sweep, covering a large space without needing the rigid support required by other materials. Tensile structures are lightweight and their extraordinary tensile capacity does not require as much supporting framework as other materials; however, deep foundations are often required to counteract the power of the wind lifting the canopy and whipping it away. On a positive note, the foundations are usually much cheaper and easier to prepare than above-ground constructions. A tensile canopy is a unique and contemporary style of building structure and its 3D nature attracts attention. Traditional structures such as flat glass, a tiled roof or polycarbonate canopy do not draw your attention in the same way. Companies alike and all the manufacturing takes place off-site. When the steelwork, cables, membrane and all other parts are complete, they are taken to the site and assembled swiftly, causing little disruption to the public or the surrounding businesses. This could prevent possible health and safety issues. Fabric structures are great for larger areas, as they offer economies of scale; however, if you were to choose a tensile canopy for a small area, this would not be cost effective. The same process would have to be carried out as for larger constructions, such as connections being engineered and checked, patterning required and corner plates and awkward angles made by the steel fabricator, all of which would cost three to four times more per square metre than for a larger tensile structure. Finally, but importantly, fabric structures are bespoke. They can be beautiful, creative, attention-grabbing and fun, and they sound great when it is raining!